KAABONG – In conservation, a veterinarian and senior Monitoring and Research warden for Queen Elizabeth National Park, Margaret Driciru, said “You see a cheetah and it’s a creature that you will always marvel about. Every day of my life in the wildlife area, is like a new day in my life to see all of these creations of God. “It’s amazing! These are creatures we must protect and so everyone who’s out there, I think it would be very nice if people teamed up with us to conserve these very unique creations,” added Dr Driciru in 2015. A game drive in Kidepo Valley National park, took me to the beautiful cheetah habitat in the hills of this isolated national park, described by many as the most magnificent and Africa’s finest wilderness. As we go through the open grasslands and bushy areas of the park, two beautiful cheetahs stand relaxed against the Park’s lush green hills sitting in the midst of the bushes. One thing one must not do is to blink because this is the surest way of losing their sight. The sun was just coming up, the morning light made the landscape look magical. The cheetahs could be seen at a distance as though they were sunbathing. They at us strangely, it felt like we had a connection but that may have been just my excitement, I could barely hold my camera. They stayed for about 10 minutes and it was the distant sound of other game drivers that startled them. This was one of the awesome, amazing experiences we had in Kidepo Valley National Park between December 27 and January 3. Mr Zachariah Lokwee, a tour guide at Kidepo National Park says one of the tourist attractions Kidepo has is presence of the cheetahs. He explained that a cheetah has a unique body structure; its long legs, flexible spine, semi-retractable claws and a long tail allow it to achieve the unbelievable top speed of 110 km/hr. “And because the body is narrow with lightweight, long slender limbs, the specialized muscles allow for a greater swing to the limbs increasing acceleration making it the fastest animal in the world,” said Mr Lokwee. He revealed that the cheetah is the world’s fastest land animal and Africa’s most endangered big cat, that uniquely adapted for speed and is capable of reaching speeds greater than 110 kilometres per hour in just over 3 seconds, and at top speed their stride is 7 meters long. Although we were in fear because of the way the cheetahs stared at us, Mr Lokwee explained that cheetahs are active mainly during the day; with hunting as their major activity and that the adult males are sociable. He revealed that at Kidepo national park cheetahs mainly prey on antelopes and gazelles which they stalk within 100 – 300 metres, charge towards them and kill them by tripping them during the chase and biting their throats to suffocation. The usual perception is that cheetahs are found mainly on flat savannah plains where they can run their prey to exhaustion to make it easier for them to make their kill with a final coup de grace bite on the victim’s wind pipe. Mr Stephen Nyadru, the Warden of tourism at Kidepo National Park said cheetahs are 99 per cent genetically identical and a virus could wipe out entire populations. “Their numbers are low and they are becoming pocketed – meaning that one small population cannot find another to breed and if a disease affects that population, they could be wiped out completely,” Mr Nyadru explains. Mr Lokwee explains that although they are the fastest animals in the cat family, cheetahs are not the strongest of cats. “They could be fast with a body built for speed – streamlined with lean muscular legs, and massive chest compared to the rest of the body to take in increased amount of air and a tail to act as an anchor –which all makes for an efficient hunter that relies on speed but it lacks in strength. “And compared to the lion and the leopard, the cheetah is the weakest of the large cats and the poorest breeder, even a huge vulture can chase it away from its kill,” adds Mr Lokwee. According to Mr Lokwee, cheetah is incredibly fast and can run up to 110mph, making it the fastest animal in the world, they purr like domestic cats but they cannot roar, have semi non-retractable claws, which distinguish them from other felines, have beautiful tear marks that run down the face and usually reflect light from the sun. According to Mr Lokwee, the gestation period for the cheetah is three months and that this results into a litter of typically three to five cubs [the number can vary from one to eight]. He added that weaning occurs at six months and that siblings tend to stay together for some time. “Cheetah cubs usually face higher mortality rates than other mammals,” said Mr Lokwee. Mr Johnson Masereka, the area conservation manager [Kidepo] said it is now common for tourists to sight in Kidepo National Park. 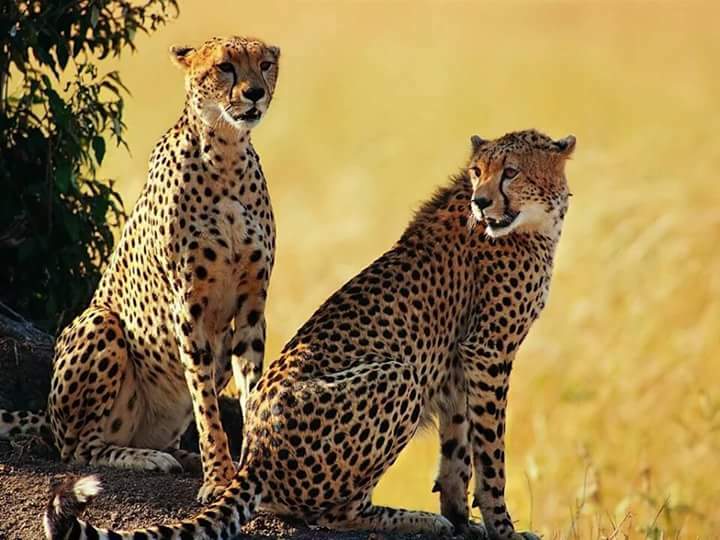 According to Mr Masereka, cheetahs are among the key tourist attraction but they are also categorised among the endangered species, which are listed under Appendix 1 of the Convention on International Trade in Endangered Species of wild flora and fauna (CITES). This means that if nothing is done to protect them or their habitat, they will become extinct in the near future. “Previously the cheetahs were among the rarest wild animals, they were near extinction but now there are many here especially in the Karamoja sub-region and the increased sightings have given hope to wildlife conservation that the situation is not as bad as it was thought, with the cheetah numbers in Uganda currently estimated at more than 25,” said Mr Masereka. He explained that it was becoming common to encounter cheetahs at Kidepo valley national park as in December alone, tourists have encountered six cheetahs and this has made part of the brightest moments for visitors intending to see the big cats at Kidepo. He said guests at Kidepo Valley national Park have been treated to some wonderful cheetah sightings in November and December and that many of these beautiful cats are found during mornings and evenings. He revealed that cheetahs are normally active during the day, especially in the cool of the early mornings and evenings, because they hunt by sight and because their main competitors; lions and spotted hyenas, are generally active at night. Mr Nyadru said the cheetah population is still small but it is growing and the prospects have never been brighter. He explained that the cheetahs are elusive animals that belong to the cat family and frequent sighting is expected to boost the popularity of Kidepo as a true part of the remaining wilderness globally. He said Uganda Wildlife Authority’s conservation programme at Kidepo has been boosted by the Africa Wildlife Foundation, which is being supported by USAID to implement a four-year programme that is expected to invest more in wildlife conservation within and outside Kidepo. Others include UNDP, which is also implementing a four-year programme on conservation of critical landscapes in northeastern Uganda. Kidepo Valley National Park is a 1,442-square-kilometre (557 square miles) national park in the Karamoja sub-region of northeast Uganda, Kaabong to be exact. It is located approximately 220 kilometres (140 miles), by road northwest of Moroto, the largest town in the sub-region. Kidepo has rugged savannah, dominated by the 2,750 metres (9,020 feet) Mt Morungole and transected by the Kidepo and Narus rivers. Tucked in Uganda’s most remote north-eastern corner, some 700km from Kampala and tucked between borders with Sudan and Kenya, Kidepo valley is an isolated park. Kidepo experiences semi-arid climate with just one rainy season per year (April – September) and the rainfall is light, with the Valley of Narus River in the south of the park, receiving some 890mm of rain a year, while just 635mm of rain a year falls in Kidepo valley to the north. Perennial water makes River Kidepo an oasis in the semi-desert which hosts over 86 mammal species including lions, leopards, bat-eared fox, giraffes, spotted hyena and black-backed and side stripped jackal, including the cheetah these are not in any other park in Uganda, as well as almost 500 bird species.